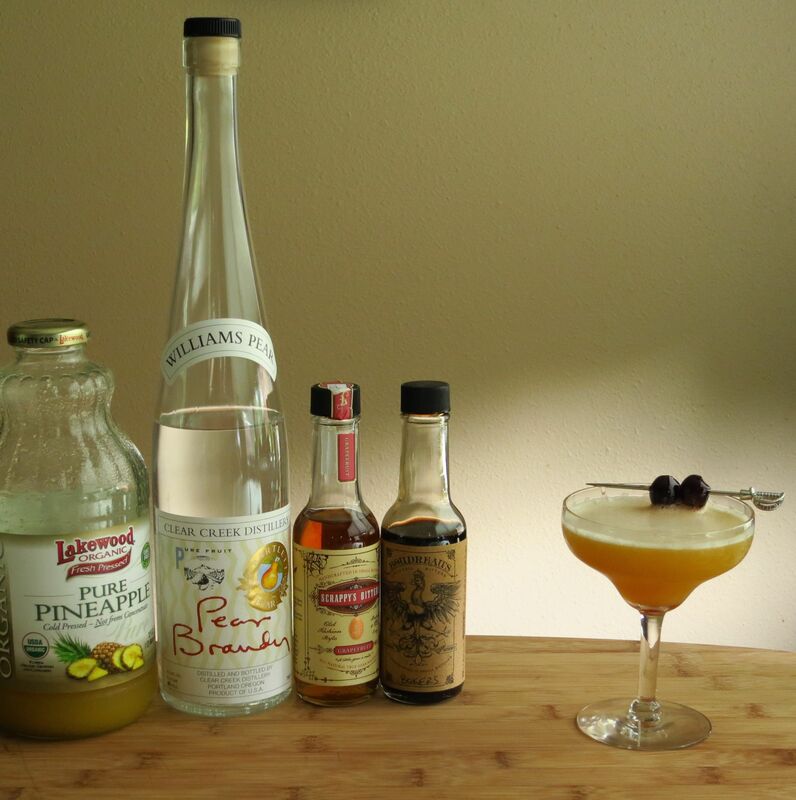 It’s Mixology Monday time again, and this month’s theme is Pineapple, courtesy of Thiago over at Bartending Notes. The first thing that came to our minds for this ingredient was tiki drinks (of course!) But then we thought, while tiki is certainly a delicious way to go, we should try pineapple in some more unusual pairings to illustrate its versatility. So we did :). Onward to the recipes. For our first cocktail, we were curious to see how pineapple worked with other fruit flavors, so we hauled out a few fruit brandies and tried some combinations. Calvados wasn’t terrible, but we didn’t love it either. Kirsch was interesting but hard to balance, but might be worth noodling more with in the future. Pear brandy was actually quite nice, as long as the proportions didn’t let the pineapple flavor get overwhelmed, so we went with that. 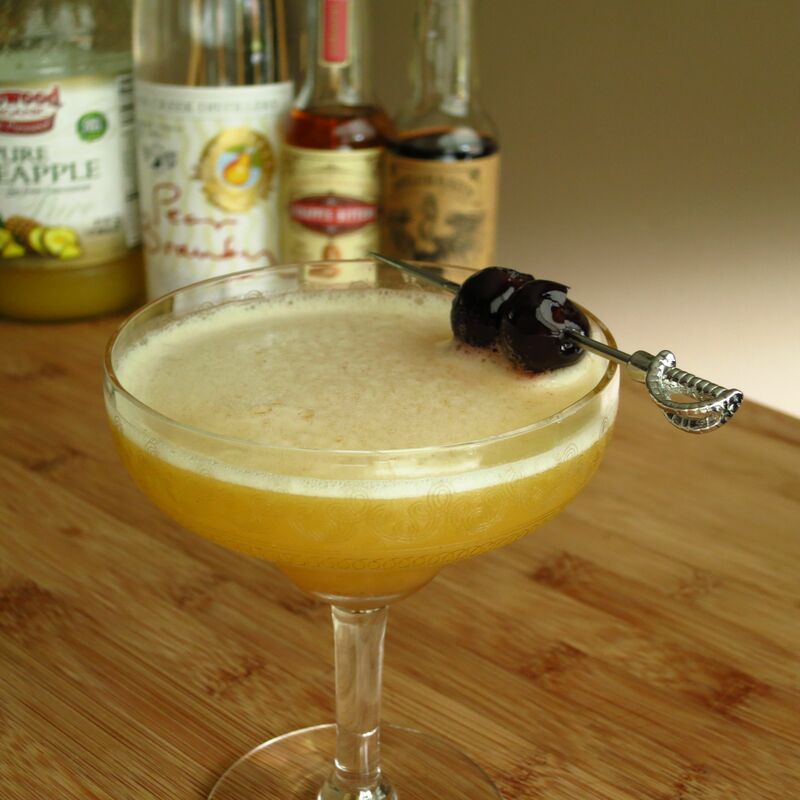 Shake with ice, strain into a glass, garnish with a cherry. Drink! Nose: Pear, pineapple, vanilla pastry cream, little bit of nutmeg. Palate: Pineapple, pear, and a little bit of grapefruit bitterness to start. Grapefruit and spice (cinnamon, dried orange peel) on the mid-palate. Finish is more pineapple, but cooked/syrupy this time rather than the fresher flavor on the front. Starts out lightly sweet, mid-palate is dry, then sweetens again a little on the end. Very light-bodied and fresh, might make a good brunch cocktail. For the second drink, Shaun was curious to see if substituting pineapple juice for cherry brandy would make for an interesting Blood and Sand alternative, and indeed it did. 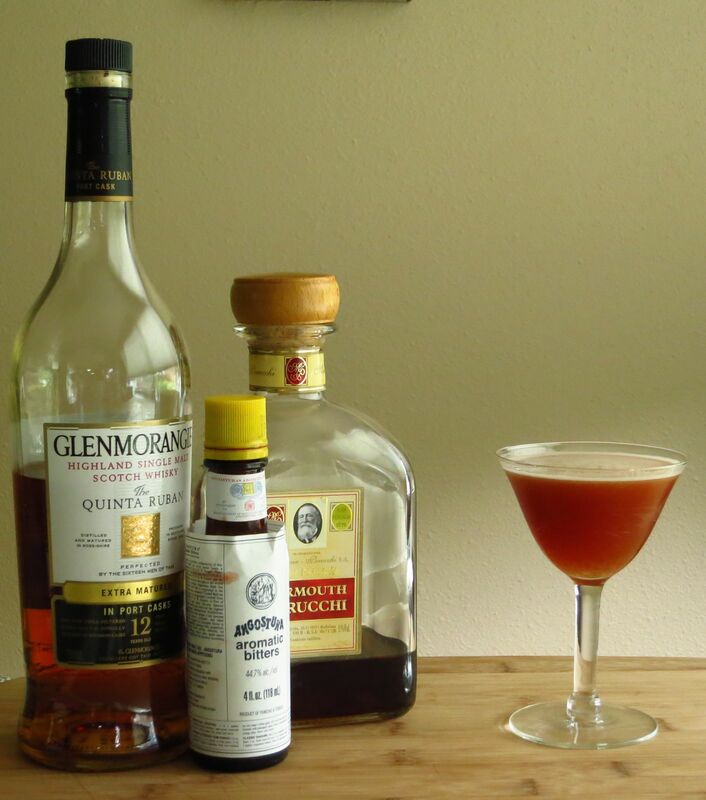 The change makes the drink a little lighter and brighter, and interestingly seems to let the herbal notes of the vermouth shine a little more. Shake with ice and strain into a glass. Drink! Nose: Cooked pineapple, Angostura spice, malt, caramel, faintly bitter green herbal notes (like boxwood). Palate: Sweet pineapple and fruit wood on the intro. Malt, caramel, sweet oak, and green herbal notes on the mid-palate. Spicy, bitter finish. As always, we enjoyed Mixology Monday and having a good excuse to spend a few hours in our cocktail laboratory experimenting with things. Thanks to Thiago for hosting this month! We look forward to trying some of the tasty pineapple creations that come out of this.. This entry was posted in Cocktail, cocktail recipe, Mixology Monday, Original Cocktail, pear brandy, pineapple, scotch, sweet vermouth and tagged miss brooks cocktail recipe, rodolph cocktail recipe. Bookmark the permalink. If you have some genever at hand you could try the White mud & sand. Thanks. Ah it is like the Algonquin. We’ll have to give the White mud & sand a try. Blood and Sand is one of our favourites, can’t wait to try this pineapple version! Where did you get the Bokers Bitters? We are in Vancouver BC, but are willing to travel to Washington (or the end of the earth) for such a bottle! Had the pleasure of being served by Murray Stenson at Canon a few years ago. A night to remember forever and definitely not the ends of the earth!! Thanks for the tip!